Real Madrid reacted perfectly to Cristiano Ronaldo’s absence with a great victory against Real Sociedad thanks to a superb performance by Karim Benzema, who scored a brace. The Basques threatened Los Blancos during the first minutes scoring an early goal, but Carlo Ancelotti men reacted perfectly and ended up trashing their rival. The game had a thrilling start with two goals in the first three minutes. The visitors took the lead as Aritz Elustondo headed a Ruben Pardo corner into the back of the net. However, James Rodriguez levelled with another header after receiving a precise cross from Marcelo. Real Sociedad suffered a blow as their top scorer Carlos Vela fell injured and had to be replaced after 15 minutes. Striker Imanol Agirretxe replaced the Mexican. 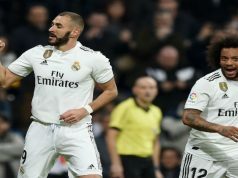 Benzema was close to giving Los Blancos the lead with a wonderful strike to the bottom corner, but goalkeeper Geronimo Rulli made a brilliant save. The Argentinian denied a powerful shot from James a few minutes later, but he wasn’t lucky in the next play. Marcelo found Benzema with an outstanding cross and the Frenchman shot straight to Rulli. However, Ramos picked up the rebound and made it 2-1. Los Merengues scored early in the second half to calm the fans nerves. Benzema lashed a precise effort into the back of the net after a one-two with Gareth Bale. The France international would seal the win with one of the most stunning goals of the season. He picked up the ball in the corner of the box and executed a perfect give-and-go with Isco before latching a superb strike to the top corner. Real Madrid controlled the game until the end and Carlo Ancelotti even gave Benzema and Toni Kroos some rest. They will need to be perfectly fit to face Sevilla on Wednesday. The Team were Fantastic The first Goal was a Shocker against us! to Win 4-1 Great Team effort all round No Complaints Keep it Up Hala Madrid ! Bravo los Blancos. Very important victory. But it surprises me the way the defense is so vulnerable. All the five defenders are international players but MG, can these guys play together? Please, we need David Luis next summer.